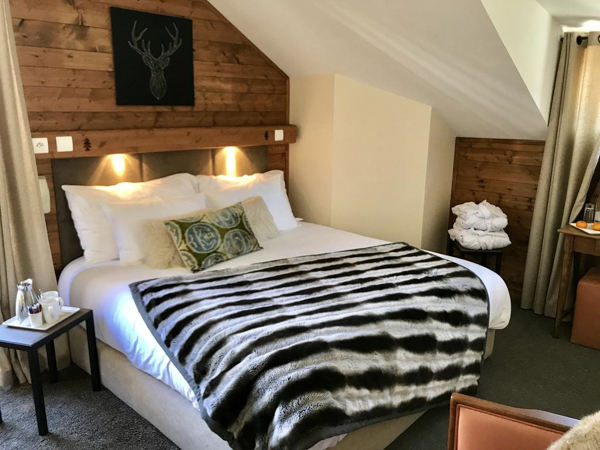 Hotel Coeur des Neiges – previously known as La Maison Blanche – has undergone more than just a name change, it has had a complete make-over, and now has a high quality, stylish interior, both in the social spaces, and in the upgraded bedrooms. As such, this has now been rated as a 3* hotel. 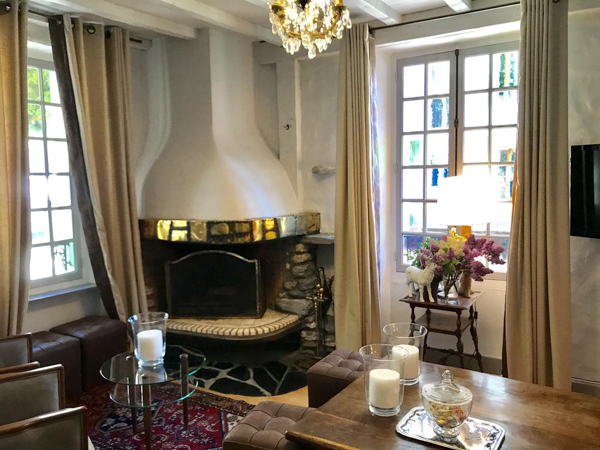 It is situated in the centre of the thermal spa town of St Gervais-les-Bains, only a short walk from restaurants, bars and shops, as well as being only 800m from the cable car with access to the entire ski area of St Gervais and Megève. Katrine – the new owner, as well as her mum, already have a reputation for being warm, friendly and welcoming, as well as for providing great service to their guests. The hotel only has 15 bedrooms, so it has a more intimate feel than some of the larger accommodations. Each of the bedrooms are a good size yet cosy, with ensuite bathrooms, some of which have also been fully renovated. Catering is currently on a B&B only basis, but the hotel may offer speciality Swiss fondue during your stay as an optional extra. 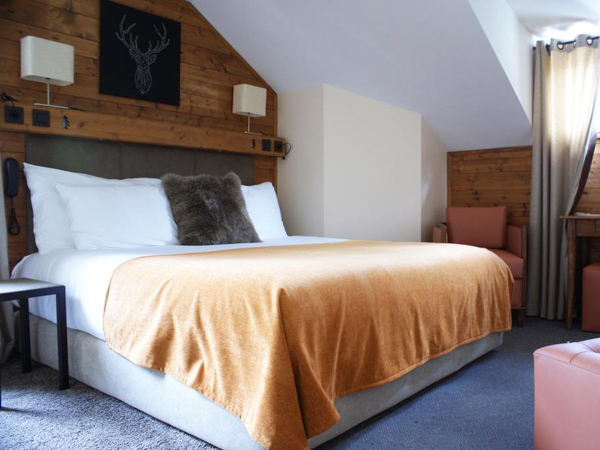 The hotel has 15 cosy bedrooms, including twins, doubles, triples and quads most with mountain views. 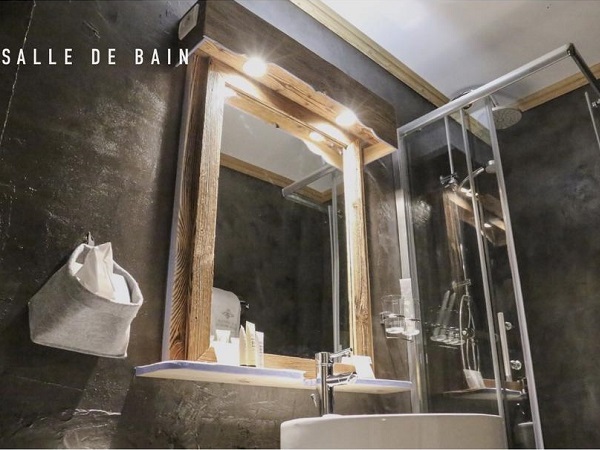 Each room has an ensuite bathroom, and they have been re-designed with a feeling of calm, comfort and softness in mind. 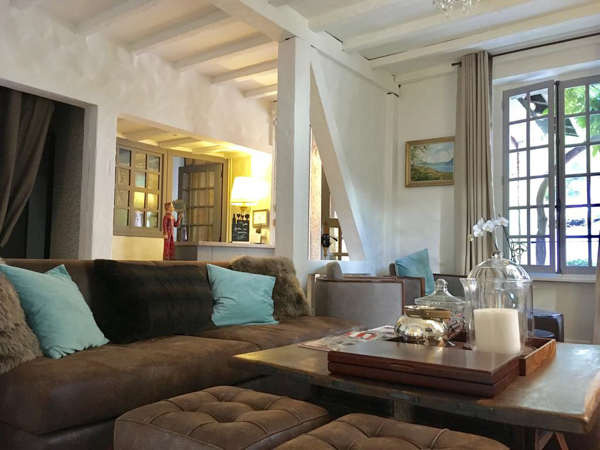 Part of that includes offering ‘Le Bar à Oreillers’ – The Pillow Bar – where you get to choose your own pillow, based on your personal preferences. 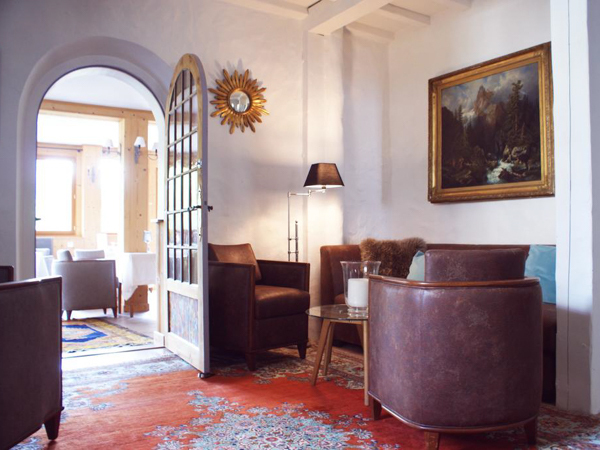 The hotel has a stylish and comfortable lounge area with a welcoming open fire, offering a selection of cocktails, wines and tapas after 4pm. They also stock a range of original ‘infusions’, made from Bach Flower Remedies, and fragranced with thyme, sage and orange flower. In addition, if you want to relax even further, the hotel has a treatment room, where you can have a soothing massage, using only high-quality products. 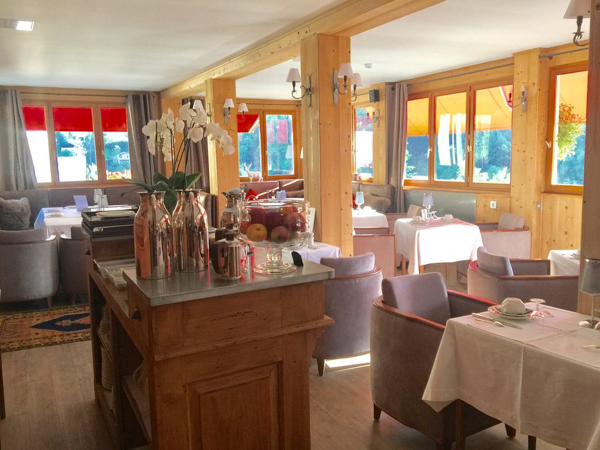 If you want a change of scene, the centre of the laid-back resort of St Gervais with its low keys bars and restaurants, is only a short walk away. Catering is currently on a B&B only basis, which gives you great flexibility for your dining options. 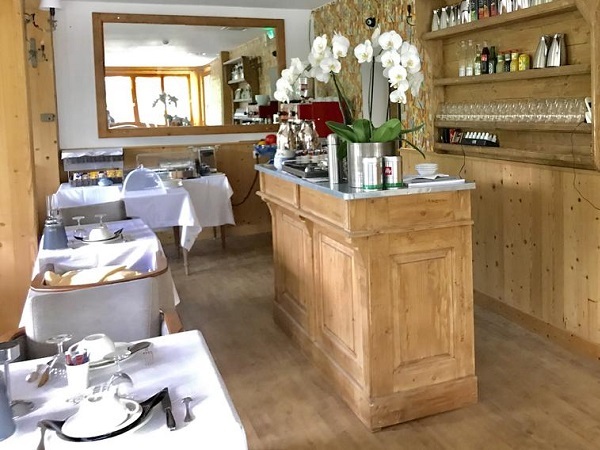 The hotel has fondue nights as an option for a special experience, but otherwise you can sample the wide choice of restaurants and bistros in the village itself. 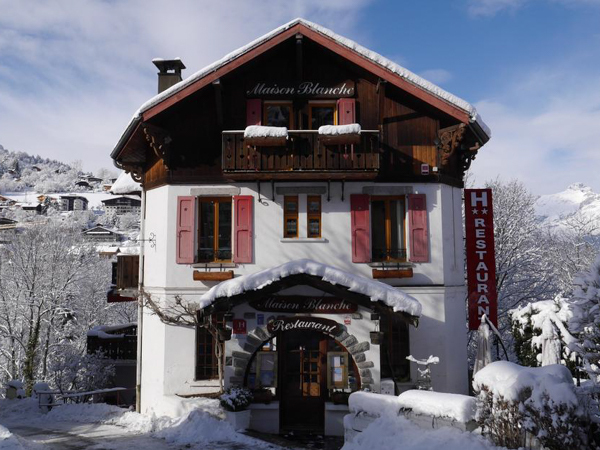 This hotel is located in the heart of the ski resort of St Gervais, just an hour’s easy transfer from Geneva airport. 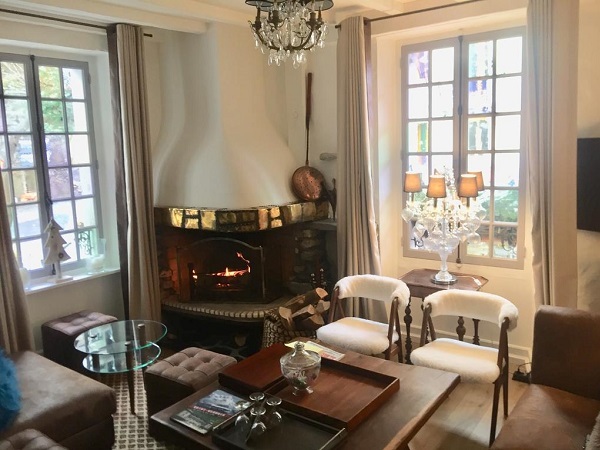 Ideally situated just 800m from the cable car giving you access to the entire ski area of St Gervais, and on to the wider Evasion Mont Blanc ski domain, which gives 445km of skiing in total. The full Evasion Mont Blanc lift pass is included in your package and will be at your accommodation waiting for you when you arrive. Access to the lifts and slopes is via the free local ski-bus which stops close to the hotel, or you can walk for a nice stretch of the legs. There are heated ski/boot lockers at the top of the Bettex telecabine, meaning you can stroll back to the hotel in ‘normal’ shoes. Airport transfers on Lite Packages are included for flights scheduled to arrive into Geneva between 1500 to 2115, and for departure flights taking off at 1600 or later. On departure, your airport transfer will leave resort 3 – 3.5 hours before your flight time, meaning an evening flight from about 2000 onwards will let you ski all day on your last day. 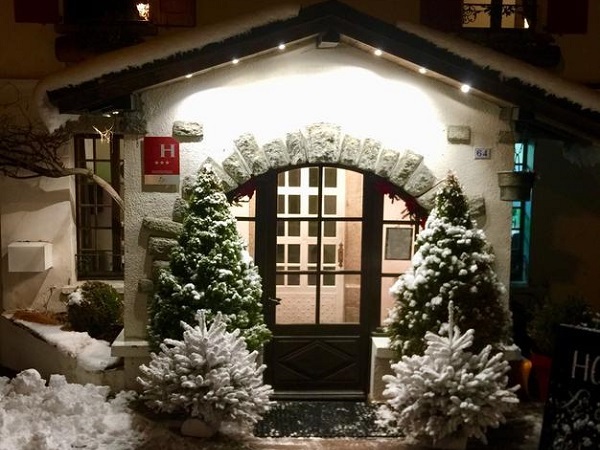 Stays at Hotel Coeur des Neiges are possible all through the winter season, from the end of December to mid-April. Stays are on a Bed and Breakfast basis. 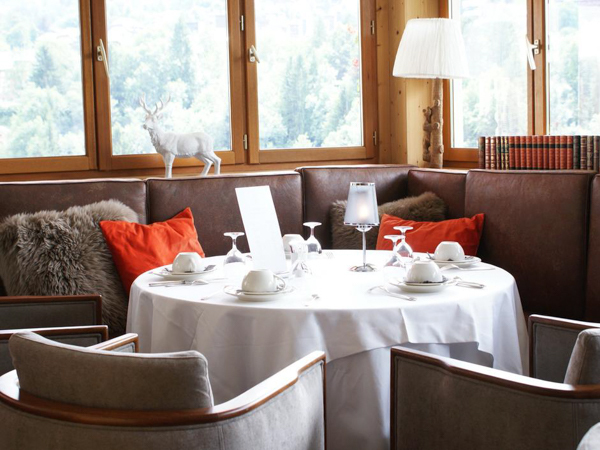 All stays at Hotel Coeur des Neiges include a full Evasion Mont Blanc lift pass, covering 445km of skiing. Airport transfers are included on standard break start / end dates, for flights scheduled to arrive into Geneva airport between 1500-2115, and depart 1600 or later. 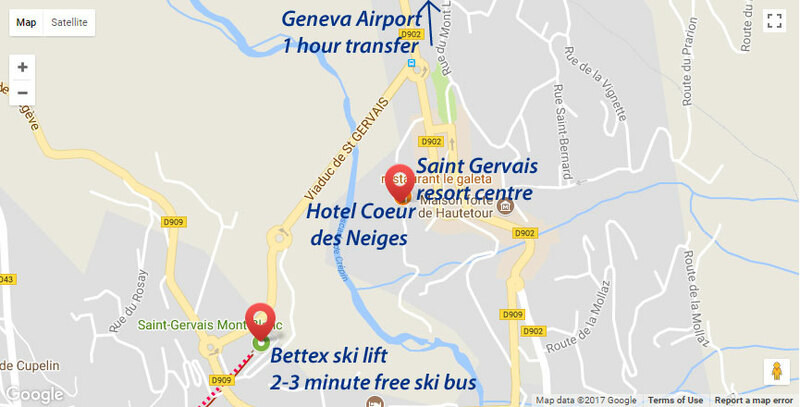 Transfer time from Geneva to St Gervais is just 1 hour. We have a partner ski hire shop in Saint Gervais who can provide you with the most convenient ski rental options. They offer good ski and snowboard equipment for all levels, and with a reduced price. We can recommend ski schools in Saint Gervais who provide good English-speaking ski instructors, for private lessons. Ski Weekender guests staying in St Gervais can pre-book their clothing package on our Ski Clothing Hire partner’s website. 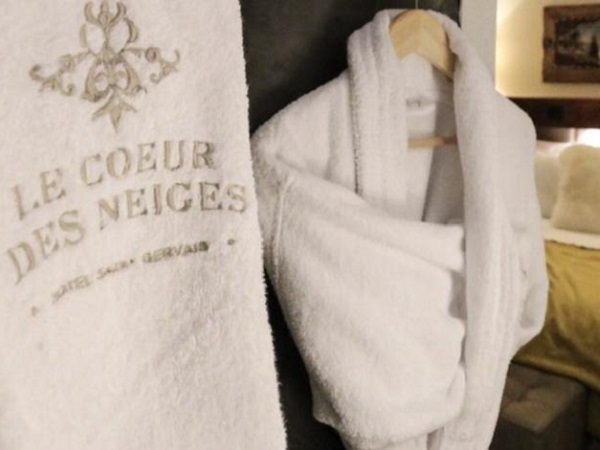 Want to stay at Hotel Coeur des Neiges... ?